According to the Bureau of Labor Statistics, in September – Nevada ranked as the state with the highest unemployment rate at 13.4 percent. California placed close by with a towering 11.9 percent. The District of Colombia and Michigan both tied with 11.1 percent. South Carolina continues to struggle with a crippling 11.0 percent unemployment. 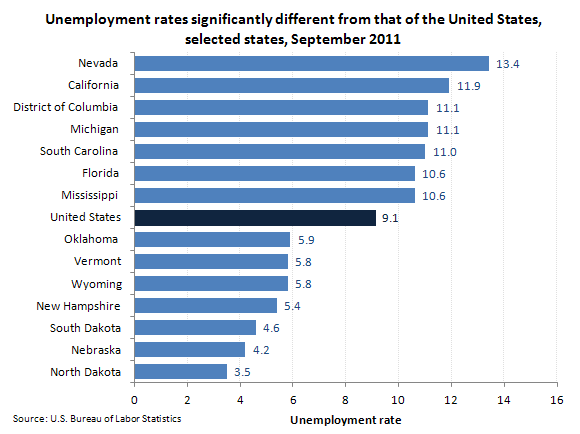 On the other end of the spectrum, a number of states are currently witnessing a modest resurgence in job opportunities, with comparatively low unemployment rates seen in New Hampshire (at 4.5 percent), and a number of states in the northern mid-west, including South Dakota with a manageable 4.6 percent, Nebraska with 4.2 percent and North Dakota with a favorable 4.2 percent. “In total, 26 states reported jobless rates significantly lower than the U.S. figure of 9.1 percent, 10 states and the District of Columbia had measurably higher rates, and 14 states had rates that were not appreciably different from that of the nation,” The B.L.S. confirmed.